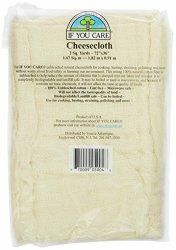 The last time I bought cheesecloth (Regency Natural Ultra Fine), I was surprised to see they were no longer made in USA. I was lucky that the local store of the online shop still had some old ones I could exchange. Today, I was at a trusted local health food store, I found “If You Care” has US made cheesecloth. Like many other cheesecloth, you will need to adjust the number of layers for your applications. I used it to soak up water droplets from the bottom of the top steamer pan so my steam buns will come out with shiny, smooth skin. I have been using “If You Care” muffin cups for years and when you take the paper off, no part of muffin comes off with it. This entry was posted in I Found This, Made in USA and tagged kitchen tools, made in USA by n2n. Bookmark the permalink.